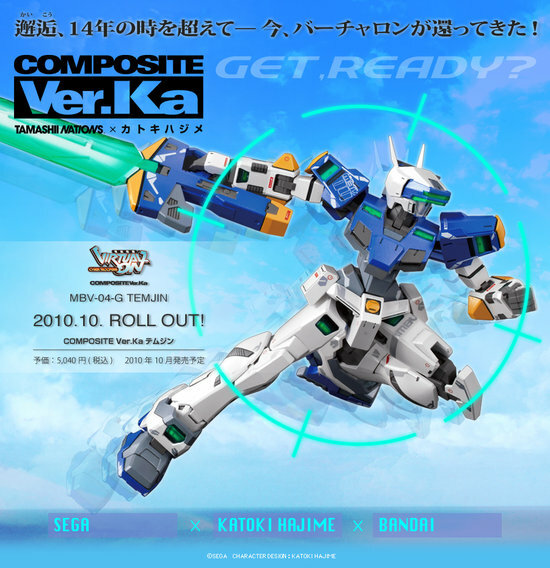 You Want This Virtual-On Toy. I was just in my local Kinokuniya looking at at a Macross Revoltech and thinking “I really like Katoki Hajime‘s mech designs, they should do more Virtual-On toys!” As if Bandai was listening to my thoughts (which would be somewhat worrying), they suddenly announce a brand new Temjin figure! Now, those of you in the know may recognize that this is the Temjin from the original Cyber Troopers Virtual-On as opposed to the one of the seven million later versions that were introduced in Oratorio Tangram and Force/Marz. In case you forgot in the 14 years since the original game’s release, let me remind you that this one uses a Sega Saturn as a jetpack. Anyway, this thing is really cool. It’s actually being worked on by Katoki Hajime, so theoretically it’ll be the most accurate Temjin toy ever! It’ll retail for 4,800 yen or about $55. It’s available for preorder at 26% off on Amiami now, so go get it!